We Just Bought SMS Presented to: LAWYER PILOTS BAR ASSOCIATION Winter Meeting, 2011 by: MICHAEL L. DWORKIN MICHAEL L. DWORKIN and ASSOCIATES 465 CALIFORNIA. 1 We Just Bought SMS Presented to: LAWYER PILOTS BAR ASSOCIATION Winter Meeting, 2011 by: MICHAEL L. DWORKIN MICHAEL L. DWORKIN and ASSOCIATES 465 CALIFORNIA STREET, SUITE 210 SAN FRANCISCO, CALIFORNIA Telephone: 1-415-421-2500 FAX: 1-415-421-2560 www.avialex.com Copyright 2011. Michael L. Dworkin. All rights reserved --Now, What Do We Do? 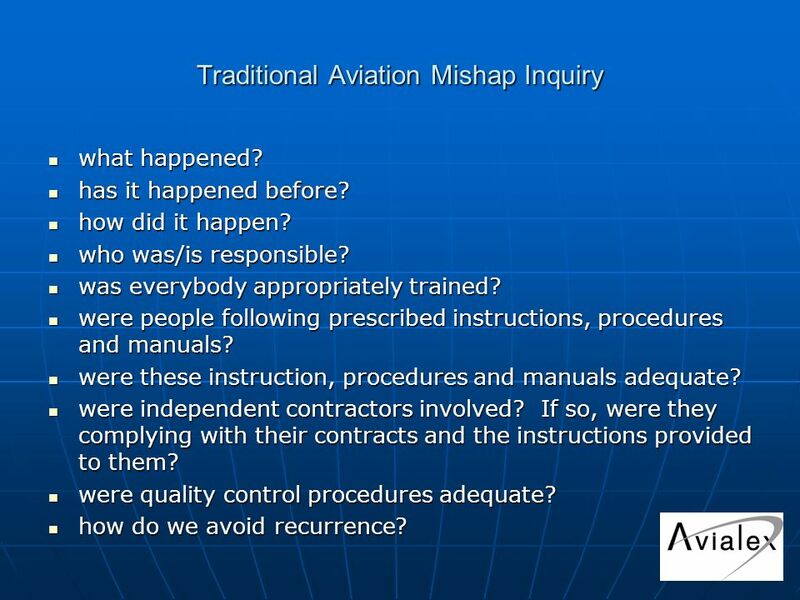 2 Traditional Aviation Mishap Inquiry what happened? what happened? has it happened before? has it happened before? how did it happen? how did it happen? who was/is responsible? who was/is responsible? was everybody appropriately trained? was everybody appropriately trained? were people following prescribed instructions, procedures and manuals? were people following prescribed instructions, procedures and manuals? were these instruction, procedures and manuals adequate? were these instruction, procedures and manuals adequate? were independent contractors involved? If so, were they complying with their contracts and the instructions provided to them? were independent contractors involved? If so, were they complying with their contracts and the instructions provided to them? were quality control procedures adequate? were quality control procedures adequate? how do we avoid recurrence? how do we avoid recurrence? 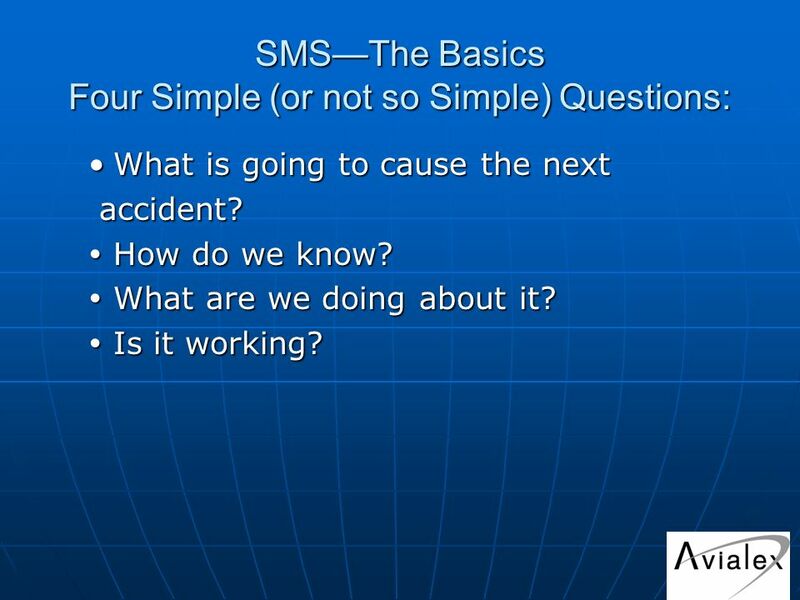 3 SMSThe Basics Four Simple (or not so Simple) Questions: What is going to cause the nextWhat is going to cause the next accident? accident? How do we know? How do we know? What are we doing about it? What are we doing about it? Is it working? Is it working? 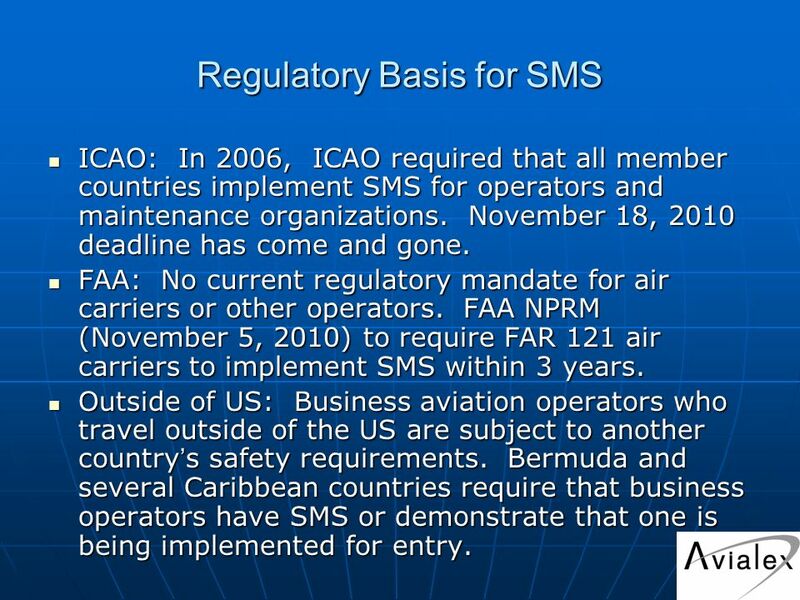 6 Regulatory Basis for SMS ICAO: In 2006, ICAO required that all member countries implement SMS for operators and maintenance organizations. November 18, 2010 deadline has come and gone. 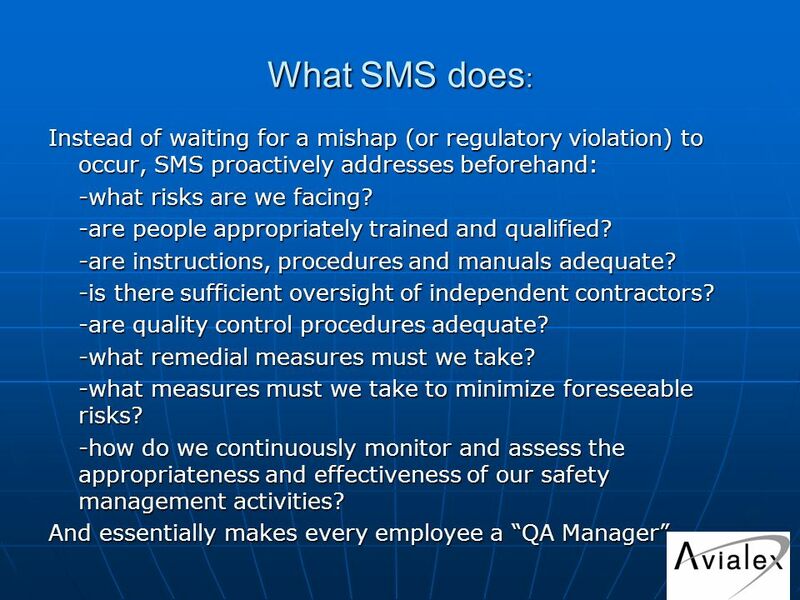 ICAO: In 2006, ICAO required that all member countries implement SMS for operators and maintenance organizations. November 18, 2010 deadline has come and gone. FAA: No current regulatory mandate for air carriers or other operators. 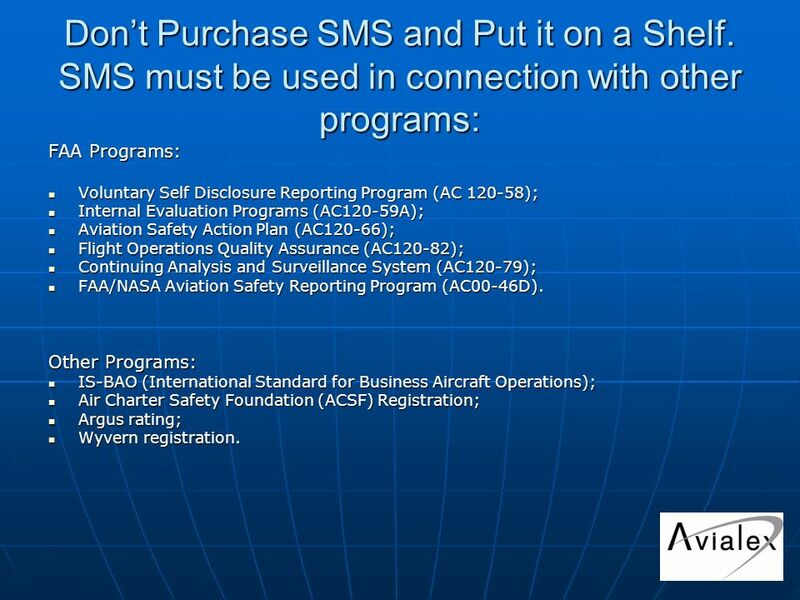 FAA NPRM (November 5, 2010) to require FAR 121 air carriers to implement SMS within 3 years. FAA: No current regulatory mandate for air carriers or other operators. FAA NPRM (November 5, 2010) to require FAR 121 air carriers to implement SMS within 3 years. Outside of US: Business aviation operators who travel outside of the US are subject to another country s safety requirements. Bermuda and several Caribbean countries require that business operators have SMS or demonstrate that one is being implemented for entry. Outside of US: Business aviation operators who travel outside of the US are subject to another country s safety requirements. Bermuda and several Caribbean countries require that business operators have SMS or demonstrate that one is being implemented for entry. 8 To achieve this: Corporate culture must be consistent with SMS goals; Corporate culture must be consistent with SMS goals; Lines of internal communication must be open; Lines of internal communication must be open; Employees must be encouraged to report safety concerns; Employees must be encouraged to report safety concerns; Management must provide environment conducive to data sharing; Management must provide environment conducive to data sharing; Employees must feel that they can trust management to be responsive to reported concerns, free of retaliation; Employees must feel that they can trust management to be responsive to reported concerns, free of retaliation; Company support of employees in defense of FAA investigations/enforcement actions. Company support of employees in defense of FAA investigations/enforcement actions. 9 Dont Purchase SMS and Put it on a Shelf. 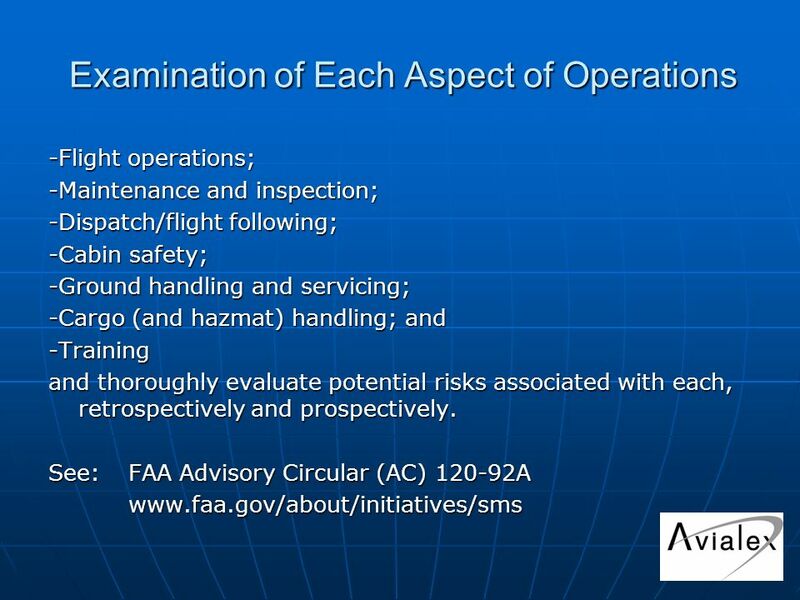 SMS must be used in connection with other programs: FAA Programs: Voluntary Self Disclosure Reporting Program (AC 120-58); Voluntary Self Disclosure Reporting Program (AC 120-58); Internal Evaluation Programs (AC120-59A); Internal Evaluation Programs (AC120-59A); Aviation Safety Action Plan (AC120-66); Aviation Safety Action Plan (AC120-66); Flight Operations Quality Assurance (AC120-82); Flight Operations Quality Assurance (AC120-82); Continuing Analysis and Surveillance System (AC120-79); Continuing Analysis and Surveillance System (AC120-79); FAA/NASA Aviation Safety Reporting Program (AC00-46D). FAA/NASA Aviation Safety Reporting Program (AC00-46D). Other Programs: IS-BAO (International Standard for Business Aircraft Operations); IS-BAO (International Standard for Business Aircraft Operations); Air Charter Safety Foundation (ACSF) Registration; Air Charter Safety Foundation (ACSF) Registration; Argus rating; Argus rating; Wyvern registration. Wyvern registration. 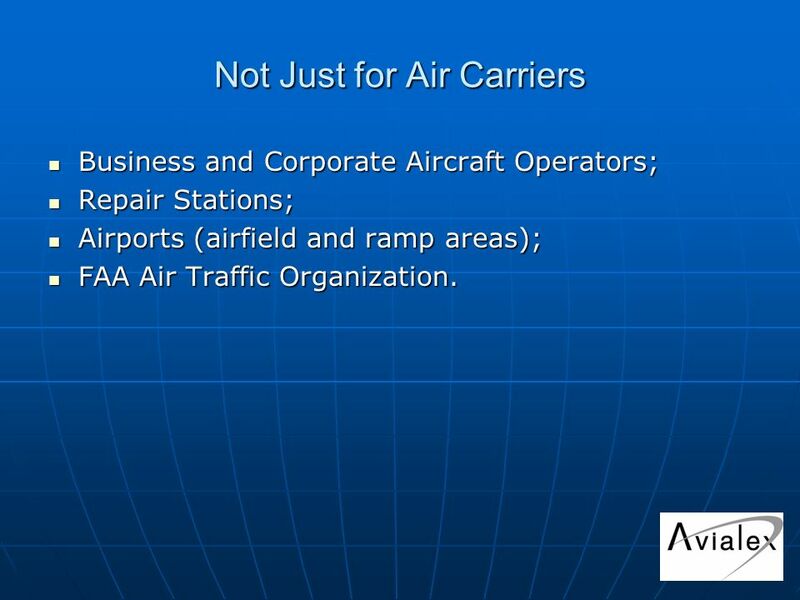 10 Not Just for Air Carriers Business and Corporate Aircraft Operators; Business and Corporate Aircraft Operators; Repair Stations; Repair Stations; Airports (airfield and ramp areas); Airports (airfield and ramp areas); FAA Air Traffic Organization. FAA Air Traffic Organization. 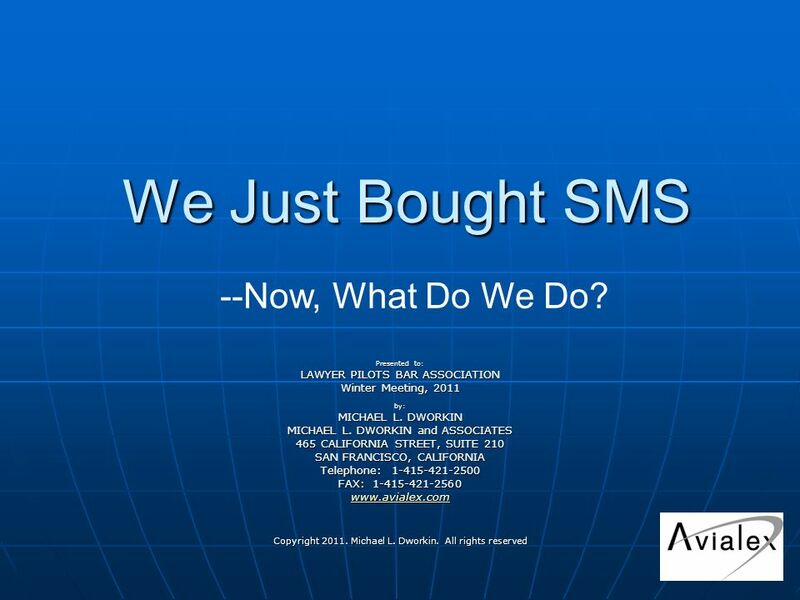 Download ppt "We Just Bought SMS Presented to: LAWYER PILOTS BAR ASSOCIATION Winter Meeting, 2011 by: MICHAEL L. DWORKIN MICHAEL L. DWORKIN and ASSOCIATES 465 CALIFORNIA." 1 Welcome Summary - First visit Dhaka Integra A/S Independent consultancy company Headquarter located in Copenhagen, Denmark Working worldwide. Session No. 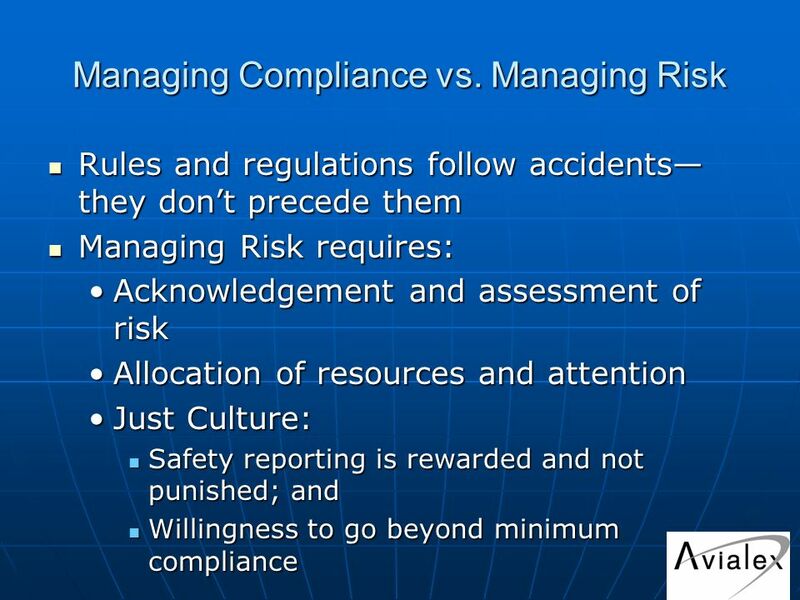 3 ICAO Safety Management Standards. The Big Picture Two audience groups Two audience groups States States Service providers Service providers. Protection of Sources of Safety- Related Information Doug Churchill EVP Professional IFATCA Protection of Sources of Safety- Related Information Doug Churchill. ATS QUALITY ASSURANCE PROGRAMMES. 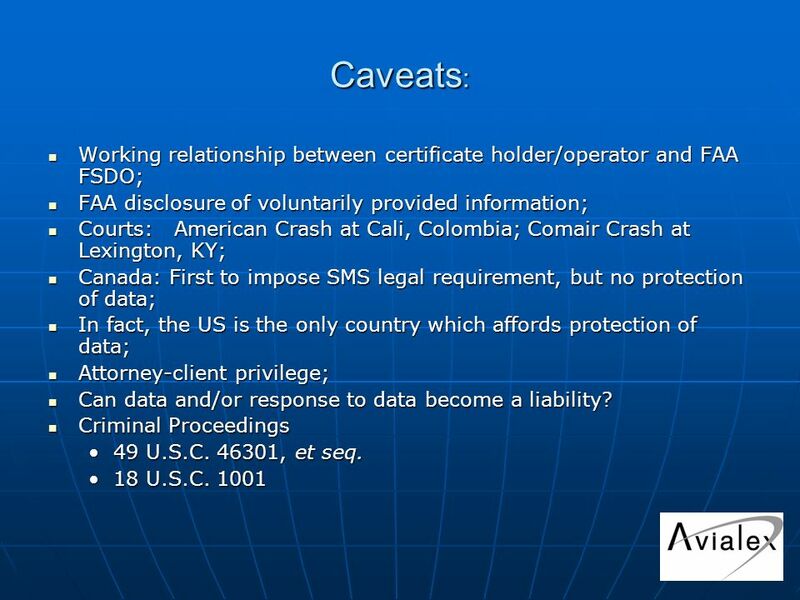 2 NAV CANADA: THE COMPANY NAV CANADA, a non-share capital, private sector corporation incorporated May 1995 Financially. ICAO State Safety Program Requirements Canadian Perspective. Federal Aviation Administration SAFETY MANAGEMENT SYSTEMS FOR AIRPORT OPERATORS. Presented to: By: Date: Federal Aviation Administration Safety Management System (SMS) at Airports : Principles APEC TPT-WG AEG-SAF Jim White, Deputy Director. 1 Vince Galotti Chief/ATMICAO 27 March 2007 REGULATING THROUGH SAFETY PERFORMANCE TARGETS. Aviation Safety, Security & the Environment: The Way Forward Vince Galotti Chief/Air Traffic Management ICAO Safety and Efficiency An ICAO Perspective.